John Van Olden is now offering professional, in-home dog training, throughout Southern Delaware including the beaches! John Van Olden’s Professional Dog Training is a balanced, reward-based dog training and behavioral problem solving program, offered selectively, throughout Delaware including Dover, the Delaware Beaches and surrounding areas. John has close to 30 years of professional dog training experience and his dog training programs are highly effective with dogs of all breeds, ages and temperaments. John has personally trained some of the most experienced and successful dog trainers in the United States, and regularly succeeds when other trainers fail. 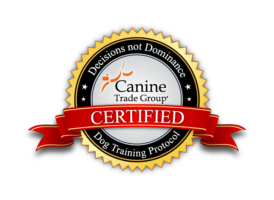 Veterinarians are not afraid to recommend John or any of the Canine Trade Group trainers, because we know how to create lasting changes in a dog’s behavior by using our training processes. If you have ever been informed by a so-called dog trainer to simply “live with” your dog’s behavioral problems, or if you’ve been told that your dog is beyond help, don’t give up! WE CAN HELP! If your dog is presenting you and your family with some “challenging” issues, John can devise a plan to put your dog back in a good space where the dog and entire family will benefit on many levels. Your kids can play with the dog. You can walk the dog without worrying about an incident and your dog won’t keep you up all night barking. By working John, you will be able to live amicably with your dog and thereby enjoy him/her for many years to come. John’s program is designed specifically for your dog and for your particular needs in relation to your environment. There are no one-size-fits-all programs or package deals–each training program will cater to your dog based on his/her unique set of traits. He is committed to designing a dog training program that works for everyone involved–including your dog, of course, but also for your family and your lifestyle as well. Best of all, we won’t abandon you along the way as we train your dog. We’re in it to win it and this means that we will work closely with you until we complete each and every of our training goals! John is a certified, professional dog trainer with a strong reputation built one success at a time! Our training is REWARD-BASED and it works, because it is based on positivity instead of punishment. And most importantly, at Johan Van Olden Professional Dog Training we teach YOU how to establish and maintain a great life with your dog. To improve your overall relationship with your dog, give us a call at 800.649.7297, or contact us by using our contact form.